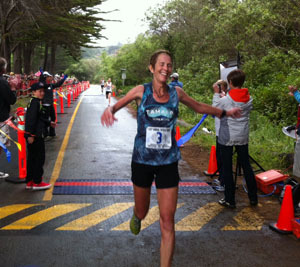 (Mill Valley, CA) - In the closest race finish in 25 years, Diana Fitzpatrick, a 55-year-old attorney from Larkspur, outlasted 42-year-old Chris Lundy of Sausalito and 56-year-old Brian Pilcher of Ross to win the 103rd running of the Dipsea on June 9. Fitzpatrick, a three-time Olympic Marathon Trials qualifier, utilized a 16-minute head start in the unique the 7.5 mile trail race to cross the finish line at Stinson Beach four seconds in front of Lundy, who placed second for the second year in a row. Pilcher, 2010 Dipsea champion, finished nine seconds behind the winner. The three embraced after crossing the finish line in the second oldest foot race in America, behind only the Boston Marathon. "It's a community affair and for that reason it means more than a lot of other races," said Fitzpatrick, whose husband, Tim, and children, Katie and Chris, also competed in the 103rd Dipsea. "The training together and the friendships and the camaraderie around it. You can feel it." Defending race champion Hans Schmid of Greenbrae, who was the oldest winner in Dipsea history last year at the age of 72, placed fourth in race, which features head starts based on age and gender. Fitzpatrick passed Schmid, who had a 23-minute head start, near the bottom of Steep Ravine along the Dipsea Trail to take the lead for good. "She passed me first and she said, `Stay with me,' " said Schmid, whose time was 19 seconds faster than his winning time in 2012. "But easier said than done." Soonafter Lundy, who lost to Schmid by 27 seconds last year, and Pilcher passed the defending champ and set their sights on catching Fitzpatrick, who last year placed third in the historic race, her highest Dipsea finish. "I actually did not expect to win today because I thought Brian Pilcher would," said Fitzpatrick, a strong endurance runner whose adjusted winning time — including her 16-minute head start — was one hour, two minutes and 42 seconds. However, when Fitzpatrick -- a graduate of the NYU School of Lawn who works for Nolo Press, a self-help publisher in Berkeley -- approached the finish line, she saw no one in ahead of her and she wasn't about to gaze over her shoulder. "I try not to look behind me," said Fitzpatrick, who set the Napa Valley Marathon women's course record in 1992. "I've been passed at the finish line and I have been outstepped at the finish line. I felt like that was going to happen today." Alex Varner, a scratch runner with no head start, passed more than 400 runners and finished fifth with an actual time of 47 minutes and 59 seconds, 62 seconds faster than last year's effort despite falling this time on the slick course. He extended his Dipsea record by winning the best time award in the race for the fifth consecutive year. No runner has won the race with the fastest overall time since seven-time Dipsea champion Sal Vasquez in 1985.